On a campsite the focus is often on the outdoor leisure equipments, but this doesn't stop some campsites to invest in closed and covered facilities. If spas and other balneotherapy areas are certainly the best example of this, the covered water parks are no exception. Since several years there is even an acceleration of investment in this area and even if it is still rare to see water cupolas and domes on campsites in the South of France, these constructions prosper on the Atlantic coast and the English Channel. In the heart of the beach resort of Saint Brevin les Pins, and a few steps from the estuary of the Loire, counts campsite Le Fief as one of the most luxury campsites of the Loire Atlantique. This 5-star campsite presents many assets, starting with its idyllic situation, only 800 metres from the beach. Other assets are the comfortable rentals, a leading Premium district, a spa, a great outdoor Water Park and since 2015... a brand new covered Water Park. 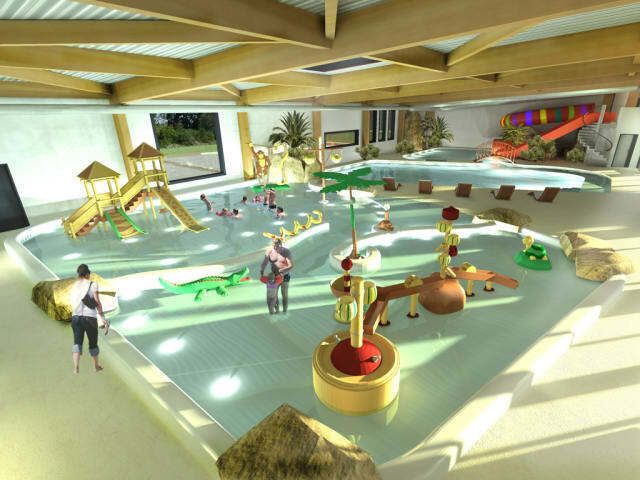 It replaces an earlier covered pool and includes a heated pool, a reception pool for the tube water slide, a toboggan with a huge track, and a fun water games area, designed to entertain and distract the youngest kids. 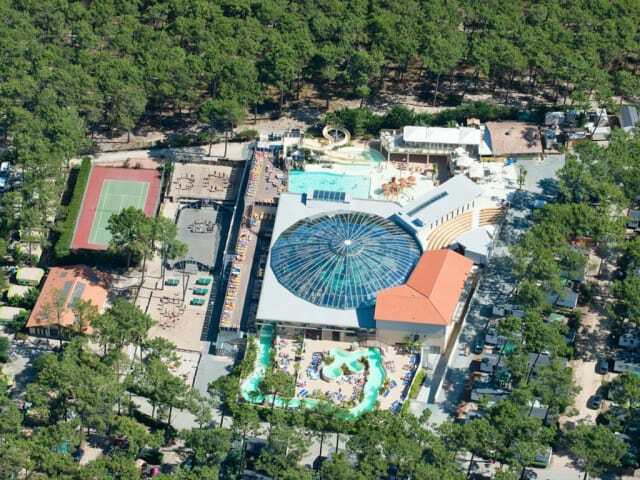 At the edge of the pond of Cazaux and Sanguinet, in the town of Biscarrosse in the Landes, 5-star campsite Le Domaine de la Rive can boast to propose its guests one of the most beautiful and largest water parks of France. It is called the AquaRive Park and extends over an area of 5,500 m²! The greater part of the AquaRive Park is located outdoors and includes various pools, water slides and fun water games areas for kids, but the indoor part is also very impressive. With a surface of 1,100 m² including 600 m² of pools, it is divided into two parts, the first includes a retractable roof of 31 metres in diameter. There is a wave pool, a small pool for children, an artificial river, and waterfalls and whirlpools! 5-star campsite Aluna Vacances, located a few kilometres from Vallon Pont d'Arc, in the South of the Vivarais, counts as one of the best campsites in the Ardèche. It features many impressive sports and leisure facilities, comfortable rental accommodations and lots of different activities and entertainment are organised on site. In 2015, a first-class new equipment has arrived on the campsite, that already had a spectacular outdoor Water Park. 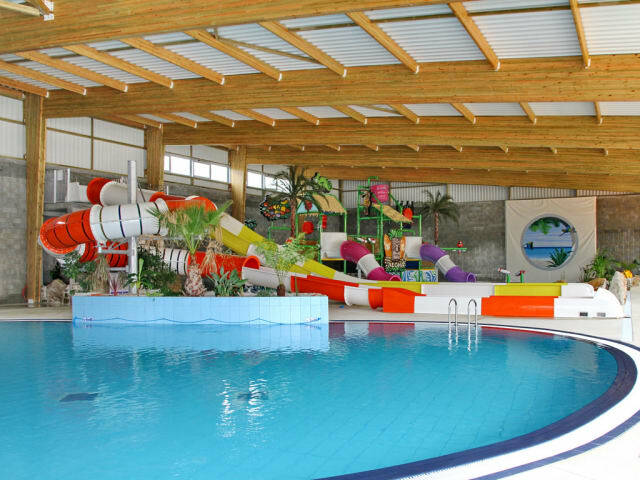 This new equipment is a covered Water Park with a surface of more than 600 m². 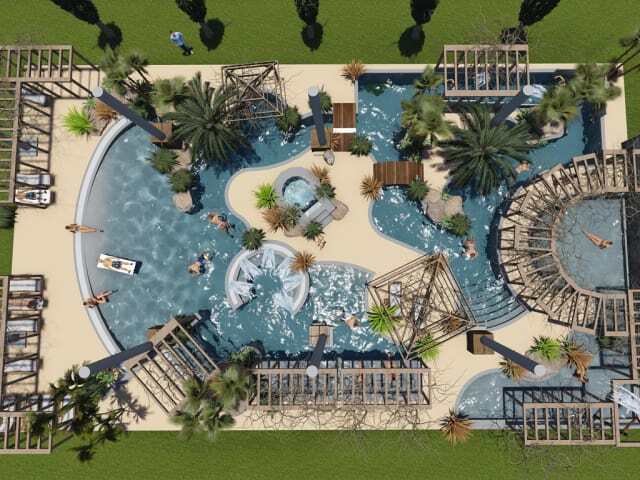 The guests of this campsite in the Ardèche can now enjoy a heated lagoon, an artificial river, a jacuzzi, whirlpools, waterfalls, etc. 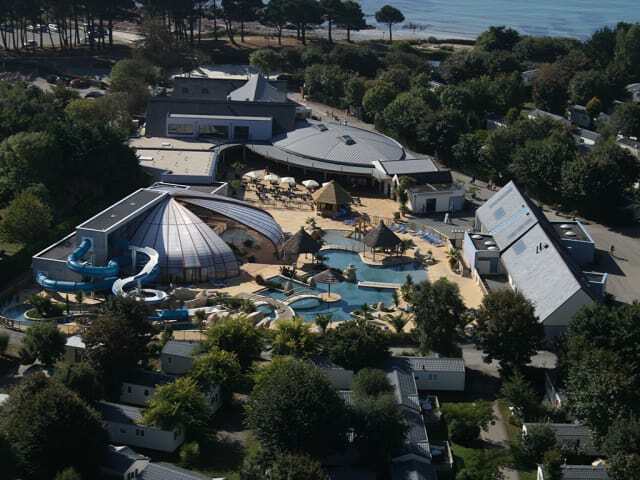 Le Port de Plaisance is a 5-star campsite in Bénodet, a famous beach resorts of the South-Finistère, situated on the river banks of the Odet mouth. 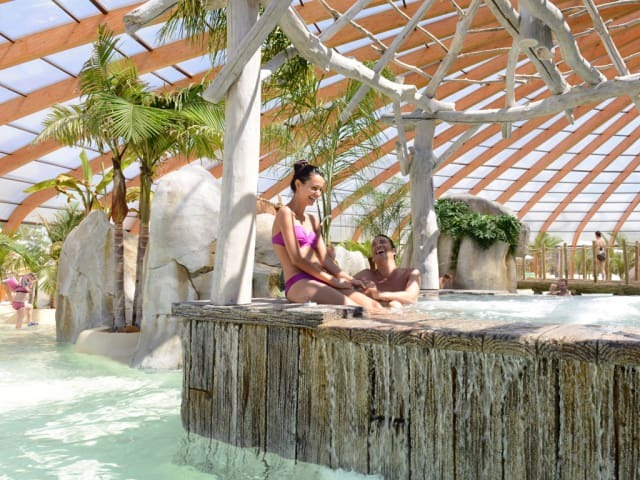 Ranking among the most beautiful campsites in Brittany, this high-end campsite invites tourists to stay in its luxury rentals and to enjoy the incredible diversity of its leisure facilities. There is for example an adventure park (!) or even a wellness area: the spa "Terre & Mer". But it is without doubt the Water Park that attracts the most visitors. 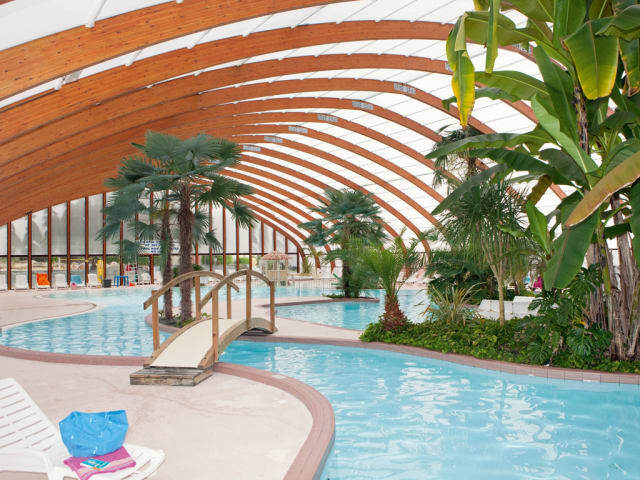 It consists of outdoor pools and water slides, but there is also and principally one of the largest covered water parks in the west of France; a giant Aquadome of 1,000 m²! It is home to more than 450 m² of pools, with the water heated at 29° C, but also a paddling pool with fun water games and two water slides! This is the number one of covered water parks on campsites. 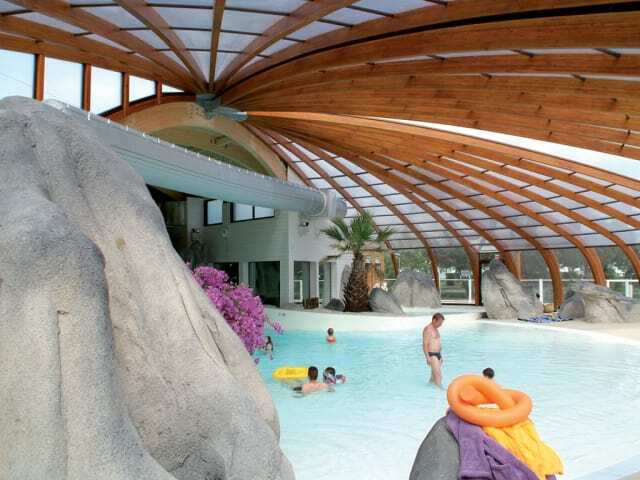 Aqualiday, that's the name, is located on campsite Airotel de l'Océan in Lacanau. This 4-star campsite is spread over a 10-hectare surface with pines and cork oaks, 600 metres from the sea and a fine sandy beach. 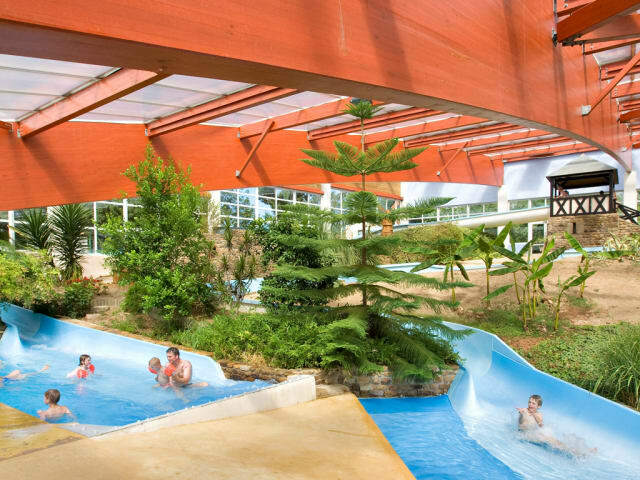 With its 550 plots, it counts as one of the largest campsites on the Atlantic coast and it's only logical that we find here one of the largest residential water parks of France. With its 5,000 m², of which 1,500 m² is covered by a huge glass dome, Aqualiday has replaced in 2013 a previous water park that was much less impressive. 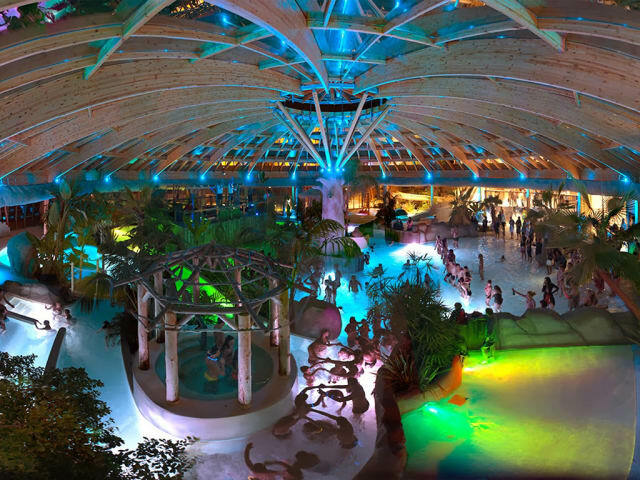 While the outer part includes a large swimming pool, water slides, a fun water games area and a counter-current swimming device, the indoor part regroups, in a tropical ambiance, a lagoon with waves, heated at 28° C, other slides, waterfalls, anatomical seats, massaging jets, a playground, jacuzzis, etc.